Aadhi Abdul Rahim received his Master’s degree in Physics from Gandhigram Rural University, India in 2009. After completing his degree, he joined as a junior research fellow at the Photonics Science Lab, Physical Research Laboratory, India to pursue his PhD. 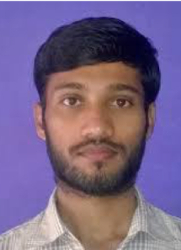 In August 2016, he successfully defended his PhD thesis on the generation of tunable spectral and spatial beams in optical parametric oscillators (OPO) at IIT Gandhinagar, India. During his PhD, he has demonstrated various optical beams such as vortex beams, Airy beams, vector beams in OPO. Since January 2017, he is working as a Mitacs Elevate Postdoctoral Fellow in the Nonlinear Photonics group of Prof. Roberto Morandotti at INRS-EMT. His current research mainly focuses on the demonstration of mode-locked lasers and frequency combs using on-chip integrated photonics platform such as spiral waveguides and microring resonators. Aadhi, V. Sharma, R. P. Singh, and G. K. “Samanta, Continuous-wave, singly-resonant parametric oscillator based mid-infrared optical vortex source,” Opt. Lett.42, 3674 (2017). Aadhi and G. K. Samanta, “High-power, high repetition rate, tunable, ultrafast vortex beam in the near-infrared,” J. of Optics, 20, 01LT01 (2017). Aadhi, G. K. Samanta, S. Chaitanya Kumar and M. Ebrahim-Zadeh, “Controlled switching of orbital angular momentum in an optical parametric oscillator,” Optica 4, 349 (2017). Aadhi, V. Sharma, N. Apurv Chaitanya and GK Samanta, “Multi-gigahertz, femtosecond Airy beam optical parametric oscillator pumped at 78 MHz,” Scientific Rep. 7, 43913 (2017). Aadhi and G. K. Samanta, “High power, high repetition rate, tunable broadband mid-IR source based on single-pass optical parametric generation of a femtosecond laser,” Opt. Lett. 42, 2886 (2017). Apurv Chaitanya, A. Aadhi, S. Chaitanya Kumar, M. V. Jabir, G. K. Samanta, and M. Ebrahim-Zadeh, “Frequency-doubling of femtosecond pulses in “thick” nonlinear crystals with different temporal and spatial walk-off parameters,” IEEE Photon. J. 8, 1 (2017). Aadhi, N. Apurv Chaitanya, M. V. Jabir, Pravin Vaity, R. P. Singh, and G. K. Samanta, “Airy beam optical parametric oscillators,” Scientific Rep. 6, 25245 (2016). Aadhi, P. Vaity, P. Chithrabhanu, S. G. Reddy, S. Prabhakar, and R. P. Singh, “Non-coaxial superposition of vector vortex beams,” Appl. Opt. 55, 1107 (2016). G. Reddy, P. Chithrabhanu, P. Vaity, A. Aadhi, S. Prabhakar, and R. P. Singh, “Non-diffracting speckles of a perfect vortex beam,” Journal of Opt. 18, 5 (2016). Apurv Chaitanya, S. Chaitanya Kumar, A. Aadhi, G. K. Samanta, and M. Ebrahim-Zadeh, “Ultrafast Airy beam optical parametric oscillator,” Scientific Rep. 6, 30701 (2016). V. Jabir, N. Apurv Chaitanya, A. Aadhi, and G. K. Samanta, “Generation of “perfect” vortex of variable size and its effect in angular spectrum of the down-converted photons,” Scientific Rep. 6, 21877 (2016). Chithrabhanu, S. G. Reddy, N. Lal, A. Anwar, A. Aadhi, and R. P. Singh, “Pancharatnam phase in non-separable states of light,” J. Opt. Soc. Am. B 33, 2093 (2016). Chithrabhanu, A. Aadhi, S. G. Reddy, S. Prabakar, and R. P. Singh, “Generating arbitrary cebits on the orbital angular momentum Poincaré sphere,” Int. J. Quant. Inf. 14, 1640032 (2016). Aadhi, N. Apurv Chaitanya, M. V. Jabir, R. P. Singh, and G. K. Samanta, “All-periodically-poled high-power, continuous-wave, single-frequency tunable UV source,” Opt. Lett. 40, 33 (2015). Prabhakar, S. G. Reddy, A. Aadhi, Ashok Kumar, P. Chithrabhanu, G. K. Samanta, and R. P. Singh, “Violation of Bell’s inequality for phase-singular beams,” Phys. Rev. A 92, 023822 (2015). Apurv Chaitanya, A. Aadhi, M. V. Jabir and G. K. Samanta, “High-power, high-repetition-rate, Yb-fiber laser based femtosecond ultraviolet source at 355 nm,” Opt. Lett. 40, 4269 (2015). Nomoto, A. Aadhi, S. Prahbakar, R. P. Singh, R. Vyas and S. Singh, “Polarization Properties of the Airy beam,” Opt. Lett. 40, 4516 (2015). Chithrabhanu, S. G. Reddy, A. Anwar, A. Aadhi, S. Prabhakar, R. P. Singh, “Scattering of non-separable states of light,” Opt. Comm. 355, 301 (2015). Apurv Chaitanya, A. Aadhi, M. V. Jabir, and G. K. Samanta, “Frequency doubling characteristics of high-power, ultrafast vortex beams,” Opt. Lett. 40, 2614 (2015). Chithrabhanu, A. Aadhi, S. G. Reddy, S. Prabhakar, G. K. Samanta, and R. P. Singh, “Three particle Hyper Entanglement: Teleportation and Quantum Key Distribution,” Quantum Inform. Process. 14, 3813 (2015). Aadhi, N. Apurv Chaitanya, R. P. Singh, and G. K. Samanta, “High-power, continuous-wave, solid-state, single-frequency, tunable source for the ultraviolet,” Opt. Lett. 39, 3410 (2014). Apurv Chaitanya, A. Aadhi, M. V. Jabir, and G. K. Samanta, “Type-I frequency-doubling characteristics of high-power, ultrafast fiber laser in thick BIBO crystal,” Opt. Lett. 39, 5419 (2014). Prabhakar, S. G. Reddy, A. Aadhi, A. Kumar, P. Chithrabhanu, G. K. Samanta, and R. P. Singh, “Spatial distribution of Spontaneous Parametric Down-Converted Photons for higher order Optical Vortices,” Opt. Commun., 326, 64 (2014). G. Reddy, S. Prabhakar, A. Aadhi, A. Kumar, M. Shah, R. P. Singh, and R. Simon, “Determination of Mueller matrix of an optical element with Simon-Mukunda polarization gadgets,” J. Opt. Soc. Am. A 31, 610 (2014). G. Reddy, S. Prabhakar, A. Aadhi, J. Banerji and R. P. Singh, “Propagation of pair of optical vortices through an astigmatic system,” J. Opt. Soc. Am. A 31, 1295 (2014). K. Samanta, S. Chaitanya Kumar, A. Aadhi, and M. Ebrahim-Zadeh, “Yb- fiber-laser-pumped, high-repetition-rate picosecond optical parametric oscillator tunable in the ultraviolet,” Opt. Express 22, 11476 (2014). Vaity, A. Aadhi, and R. P. Singh, “Formation of optical vortices through super-position of two Gaussian beams,” App. Opt. 52, 6652 (2013). K. Samanta, A. Aadhi, and M. Ebrahim-Zadeh, “Continuous-wave, two-crystal, singly- resonant optical parametric oscillator: Theory and experiment,” Opt. Express 21, 9520 (2013). Optical square waves from a nonlinear amplifying loop mirror laser. SPIE Photonics West (2018). Multi-GHz femtosecond Airy beam radiation in higher-harmonic fractional cavity OPO, CLEO, paper JTh2A-90, Optical Society of America (2017). Direct generation of tunable optical vortex dipole beams using a Gaussian beam pumped optical parametric oscillator, Frontiers in Optics 2014, paper FW2B-2, Optical Society of America (2017). Tunable, Continuous-wave, Doubly-resonant Vortex Beam Optical Parametric Oscillator, CLEO, paper SW1Q.2, Optical Society of America (2016). High-power, cw, Airy beam optical parametric oscillator, CLEO, Post deadline paper JTh5A-6, Optical Society of America (2015). All periodically-poled crystals based source of tunable, continuous-wave, single-frequency, ultraviolet radiation, CLEO, paper JTu5A-26, Optical Society of America (2015). Observation of cross polarization of linearly polarized Airy beam, Frontiers in Optics 2014, paper JTu3A-11, Optical Society of America (2015). Single-frequency continuous-wave tunable ultraviolet sources based on BIBO and PPKTP crystals and their comparative studies, Proc. SPIE-9654, International Conference on Optics and Photonics (2015). Optimization of frequency-doubling of high power, high rep-repetition rate, femtosecond fiber laser in thick nonlinear crystal, International Conference on Fibre Optics and Photonics (Photonics-14), paper M4A-28, Optical Society of America (2014). Continuous-wave, high Power, single-frequency, tunable ultraviolet source based on all periodically poled crystal, 12th International Conference on Fiber Optics and Photonics (Photonics-14), Optical Society of America (2014).